Our lives are finite. There is so much love to share, so many things to accomplish, so many philosophical puzzles to solve before our time is up. But eventually, for every individual, life does end. Even more daunting than our own eventual demise, is the idea that our loved ones may die before us. This can be a frightening prospect, especially for a child. How does a child cope when he is not ready to prevail on his own? This complicated question is explored with thoughtful grace in Kubo and the Two Strings. The set-up is this: Kubo is empowered by the great love of his mother and father and is searching for the further strength he needs to protect himself from his vengeful grandfather and his mother’s villainous sisters. The character development is given just the right amount of detail to make us care about Kubo’s journey. 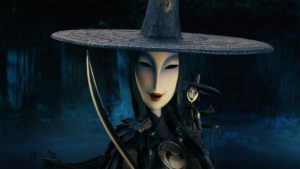 The cold stone masks and bone-chilling voices of Kubo’s aunts as well as the utter lack of humanity of Kubo’s grandfather make them memorable antagonists. Each character in the movie has believable motivations. Dialogue is deftly interspersed with humor to simultaneously drive the plot and entertain. The narrative is written with not so much of a heavy-handed message as compelling, interwoven themes and motifs throughout. My favorite theme in the movie is the idea that memories are the most powerful kind of magic there is. Without our memories, who are we? Conversely, if those we leave behind carry our memories with them, do we live on? Please allow me to pose that this possibility is legitimate, based on the relationship I shared with my late grandmother. My grandma was someone who did grand jetés in the sprinklers with me, regularly stocked her cookie jar with homemade treats, played double solitaire and pretended not to notice when I cheated, brought out the Boggle set and taught me words like “snit” (because I was always in one, although she never seemed to mind), brought me Get Well cards when I was sick, told me I made the best cakes, always had an amusing story to share, and, without exception, made me feel seen and heard. In other words, wherever she was, I wanted to be too. I was devastated when she unexpectedly died of a heart attack. 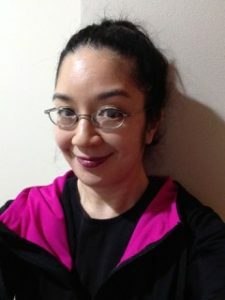 I would see strangers on the street who mildly resembled her and wish that they were her, that she was still walking around. I thought of her constantly. It didn’t seem right that she was gone. It didn’t seem fair. Fast forward twelve years later to the birth of my first child. 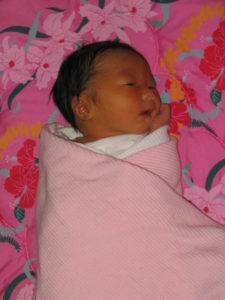 It’s a girl, and I have given her my grandmother’s Japanese name. I lay my new daughter down in our living room for the first time and am so struck with the feeling that she has the same serenity as my late grandmother that I have to take a picture of her. As my daughter grows, my grandmother visits me in my dreams. I tell Grandma what’s new. She beams with pride. I wake up in tears. Sometimes their obstinate behavior seems like karma for my own past insolences. But theirs is not as audacious as mine. My eldest has the even temper and patience of my grandma. Is it weird, I wonder, if one day I tell her that I see a lot of my grandma in her? Whether or not this is valid, the idea that my grandma lives on in the stories I tell about her makes sense to me. I didn’t have kids simply to repopulate the earth, but because it is my hope that a small part of me will live on in them as well. 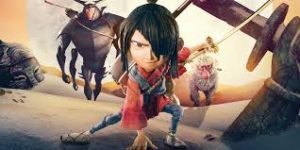 Similarly, Kubo and the Two Strings is not simply a movie to sell tickets. The movie is Kubo’s story of his family. He is sharing their story and keeping their memory alive. In this way, they, too, will live on. 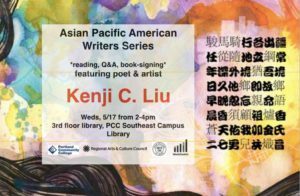 Portland Community College’s Asian Pacific American Writers series is hosting a reading, Q&A, and book-signing with poet and artist Kenji Liu on it’s Southeast 82nd campus.